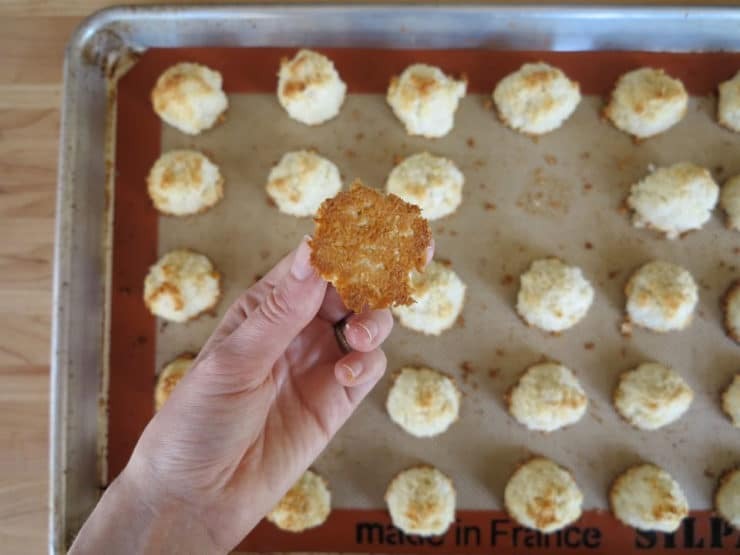 Today’s blog features everybody’s favorite Passover cookie– the macaroon! Flourless, chewy, and delicious, the macaroon has become a staple for Jews avoiding chametz during Passover. Jews and macaroons go way back. The delectable sweet originated in Italy in the 1700’s, where they were made with almond paste. The recipe was passed on to Italian Jews who appreciated that they contained no flour or leavening, and thus could be enjoyed during Passover. 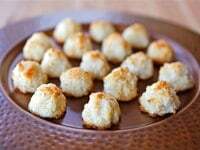 American macaroons are usually made with coconut. In Mediterranean Sephardic Jewish communities, they are more often made from almonds and flavored with lemon zest. I love the lemon/almond flavor combination, but coconut adds a great chewy texture. So I decided to combine all three ingredients—which resulted in this Lemony Almond Macaroon. They’re so simple to make and really delicious. Try them for Passover, or any time you’d like a sweet, lemony treat! Preheat your oven to 325 degrees F. In this recipe, you can use either grated fresh coconut or dried coconut flakes. 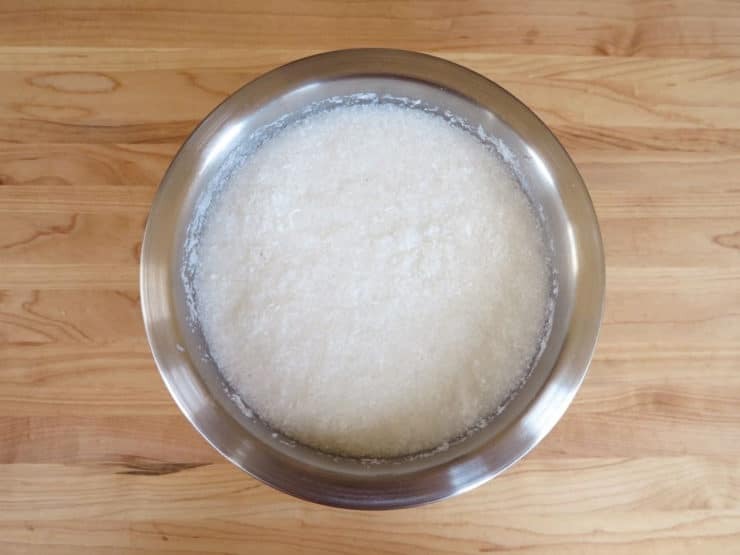 If using dried coconut, rehydrate it by pouring it into a bowl and covering it with warm water. Let the coconut soak for 5 minutes, then drain. Squeeze all the excess liquid out firmly with your fingers. Proceed with recipe. If using fresh coconut, no need to prep it-- simply proceed with recipe. 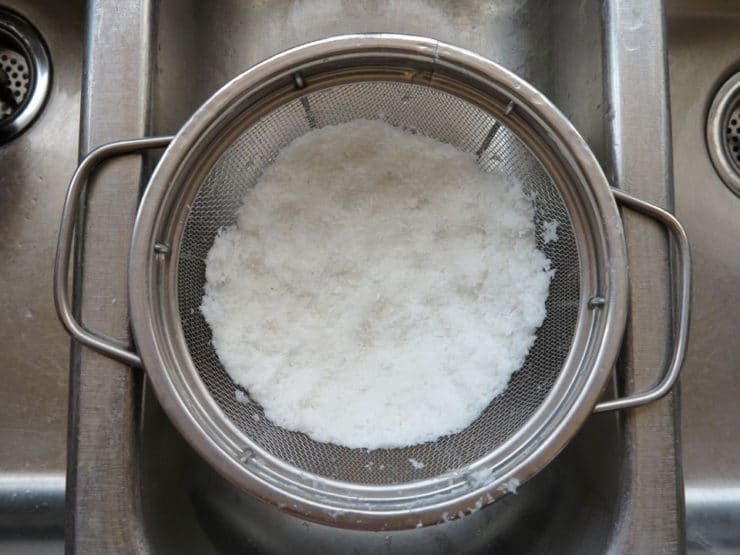 Place almond slivers and coconut in a food processor, pulse into fine crumbs. 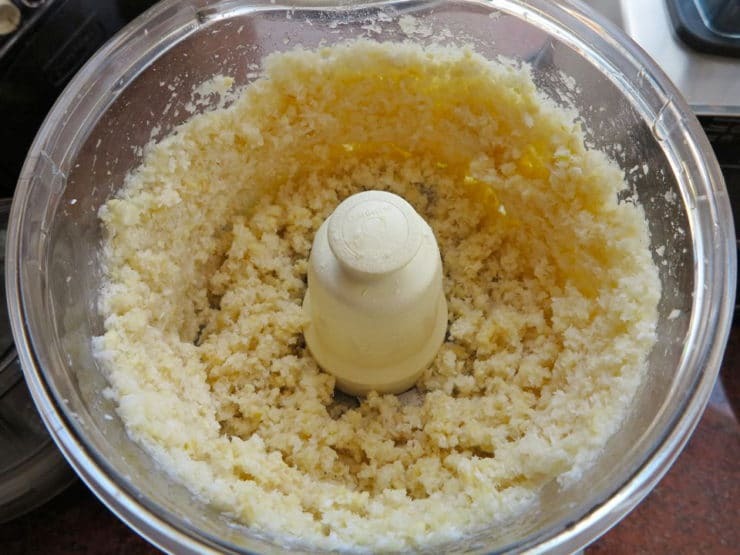 Add 3/4 cup of sugar, lemon zest, lemon juice, almond extract, vanilla, egg and salt to the food processor. Process for about 1 minute until the mixture becomes a sticky mixture of fine crumbles. Line a baking sheet with parchment paper or a silpat. Place rounded tablespoonfuls of the coconut mixture onto the baking sheet, evenly spaced, forming the mounds into haystack-like shapes. 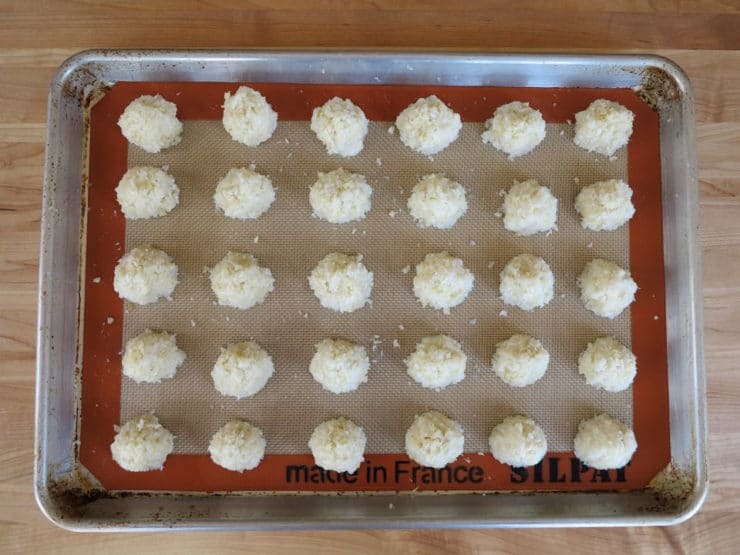 Place the macaroons in the oven and let them bake for 30-40 minutes, till the tops of the haystacks turn golden brown. 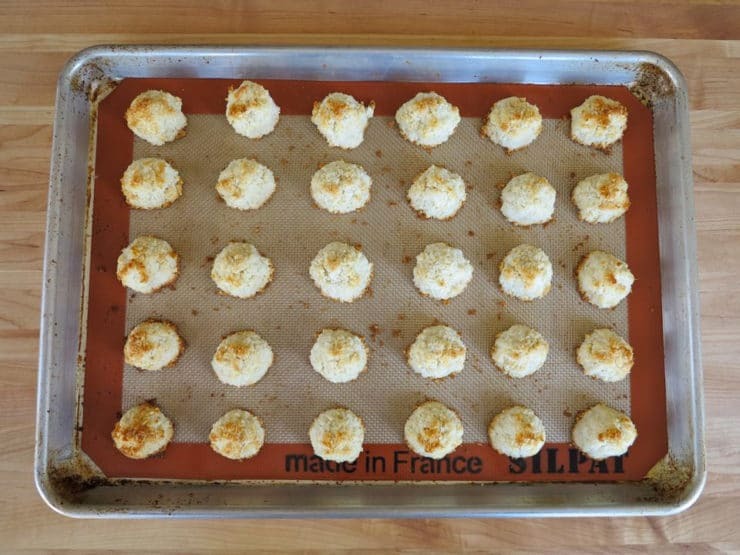 Remove the macaroons from the oven and allow to cool directly on the baking sheet. Do not try to remove them before they'll cool; when hot, they are delicate and prone to crumbling. They become firmer as they cool. When cooled completely, gently pull them from the baking sheet. The bottoms should be golden brown. Store macaroons in a sealed, airtight plastic container. When fresh from the oven, the macaroons will be crisp on the outside, soft inside. They become softer over time when stored in a sealed container. Easy to make, quick to make, and delicious! I made them for Passover, but will bake them again any time! Hi Tori – I’m looking forward to making these macaroons this weekend! do you recommend sweetened or unsweetened shredded coconuts? thanks. Wendy, I use unsweetened. Enjoy! I made these during Passover, and they were wonderful! So much better than anything store bought. They were incredibly easy to make. The only negative was that they were so good, I ate way too many. I have ground walnuts.. Can I use them instead of the almonds? Here again, I forgot to say that I used organic shredded UN-sweetened coconut! Ooops, sorry I meant that I FILLED the chocolate covered macaroon shells with the berries and sprinkled the coconut on top! Just wanted to share with you that I made 2 kinds of macaroons this Pesach. The first with unwhisked egg whites and coconut date palm sugar which is low glycemic. I covered the bottoms of these with Kosher chocolate. The next were with whipped egg whites. I made the mixture and fit them into muffin papers like a shell. I baked them on 300 degrees until the edges were lightly golden. I had to push the bottoms down as they bubbled up slightly. When they were cool, I coated them with the Kosher chocolate. When dinner was done, I placed a scoop of organic strawberries and blueberries on top with a sprinkle of coconut! Whipped cream was optional. They really went over well and were so beautiful! Thanks for all your inspiration! Love your blog and have turned so many folks onto it…Thanks again. Hey there! I’ve been reading your blog for a while and have been absolutely fascinated by what I’ve read–not only about the food, but the culture it ties into. Having a few Jewish friends, I’ve always wanted to understand more about Judaism but haven’t ever found a place so open and warm as your site here. Thank you for that! Anyway, I was wondering if there’s a way to make this recipe without the coconut. I’m allergic, you see, but these still sound delicious. Thank you! 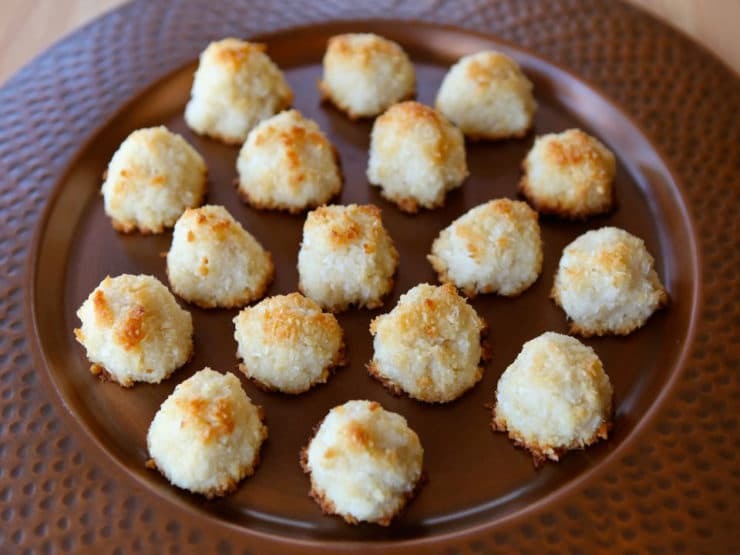 You can definitely make these without coconut… in fact, Sephardic Jewish communities throughout the Middle East make them that way. Double the amount of almonds, increase the sugar to 1 cup (to make up for the sweetness lost from the coconut), and use 3-4 egg whites to bind. Start with 2 eggs and see if the dough is manageable. If it feels too dry or stiff, process another egg with the mixture. The macaroon will lose some sponginess, but it will taste delicious. Let me know how it works for you! Joan, I just saw your comment, too– yes, I do have a Sweet and Sour Soup recipe, hoping to post it sometime this winter if time permits. It’s wonderful stuff! Tori, do you have a good recipe for Sweet and sour Cabbage soup? When my pc crashed I lost my favorite recipe that I had gotten years ago from a WTTW program that featured Jewish good. I remember it was made with ketchup, brown sugar, lemon juice and of course cabbage. I would appreciate your help. Dear Tori, I’m not Jewish but I love cooking and I subrcibe to a lot of cooking sites. Yours are my favorite blogs. Your so consistent and interesting and have such good advice for those of us who love cooking. Most of all I have never had Jewish cooking before but have made several of your recipes and have enjoyed them! Thanks for your site. Sincerely, Yolanda. Delicious! And kosher! Are you sure you weren’t born Jewish!?!? Love your blog! Following you loyally! I bought some macaroons from Trader Joe’s last week and thought nothing could be better — then I made your recipe! How fantastic! I’m very proud of myself, they taste better than from TJ’s, no small feat you will agree. Keep up the amazing work! I know you have lots of fans like me who really appreciate it. Hi Diana, lemon zest is finely grated lemon peel. Grate the surface of the peel off as though you were grating cheese (just the yellow layer, don’t grate the white part beneath). There are lemon zesting tools for this purpose, or you can also use a fine holed cheese grater.